Shale gas isn’t usually thought of as a green alternative the way that renewables like wind and solar power are, but it’s got some serious eco-credentials. Shale gas emits around 117 pounds of carbon dioxide for every million British thermal units of energy. That’s far less than the 228.6 pounds released by the same amount of anthracite coal, or the 214.3 pounds emitted by the slightly greener subbituminous coal. It even beats other common energy sources. Diesel releases 161.3 pounds for every one million British thermal units of energy while gasoline emits 157.2 pounds. With shale gas emitting roughly half the carbon dioxide that traditional coal-powered energy does and less than other common energy resources, its sustainable potential shouldn’t be underestimated. The burning process that turns coal into energy releases nasty chemicals like sulfur dioxide, mercury, nitrous oxide, and other harmful particles into the atmosphere. Shale gas produces only miniscule amounts of these air pollutants, so the rise of shale gas production is likely to improve America’s air quality. Cleaner air benefits the planet and its people who can suffer from strokes, heart disease, asthma, and lung cancer as a result of air pollution. Environmentalists have raised concerns over the leakage of methane and other volatile organic compounds during shale gas production. However, green completion technology allows energy makers to capture all or most of these noxious gases. Enforcing the use of this technology is the key to minimizing air pollution. It also makes real financial sense. Existing green competition technology will cut methane emissions by about 40 percent over the next five years. Its employment will cost less than a penny per thousand cubic feet of shale gas produced. At today’s prices, this amount of shale gas costs between $4 and $5, so minimizing the leaks could really boost the bottom lines of energy providers. A recent study released by the University of Oxford’s Smith School for Enterprise and the Environment found that U.S. coal production and imports had dropped off significantly since 2007, the year when shale gas production took off. The research found local coal imports have fallen to “negligible levels.” Meanwhile, homegrown production of high-polluting fossil fuel has been cut by a third. “A global shale gas boom could therefore indeed lead to a crowding out of most pollution energy sources, such as coal,” the study concluded. We’re already seeing the effects of this “crowding out,” with CO2 emissions falling sharply in the United States in recent years. In 2007, America’s carbon footprint was larger than it had ever been. Yet by 2012, its CO2 emissions had dropped to levels not seen since 1995. A reduction of about 12 percent was too significant to be explained by coincidence or other factors. It was even greater than the five percent pledged by the nations of the European Union that ratified the Kyoto Protocol. America wasn’t interested in making such a promise, yet it managed to more than double the efforts of countries that did sign the bill. It certainly wasn’t a result of reduced economic activity, either. While the global economy took a beating between 2007 and mid-2009, since that time America’s gross domestic product has outstripped Europes. However, U.S. CO2 emissions have decreased while those in European nations spiked again after 2009. 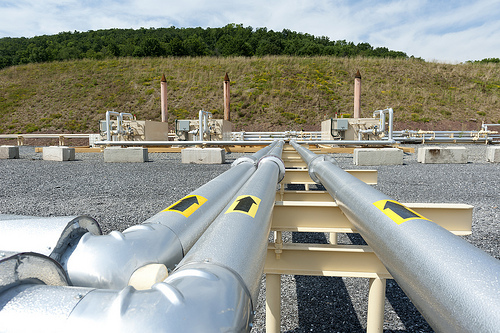 Many of the concerns surrounding shale gas production spring from “what if” scenarios. Environmentalists worry the chemicals used in the process could leach out and contaminate water supplies, but the Oxford researchers insist strict regulations can prevent any potential damage. “Implementation of smart policies will be critical to ensure that these resources are not only a winner for politics and economics, but also for the environment,” the report insisted. Many environmental lobbies are concerned that shale gas will edge out emerging green energies like wind and solar power. But to suggest that these renewable energies will thrive without the competition of shale gas is naïve. Christof Rühl, BP’s chief economist, recently confirmed that shale gas is a much more affordable way to replace high-polluting coal and reduce CO2 emissions than renewable power. Governments have limited energy budgets, so it makes sense that they’ll pursue options like shale gas that are relatively green yet inexpensive. Without the competition of shale gas, governments would build more coal-fired power plants that would continue to produce high-polluting energy until 2050. Renewable energy can’t yet persuade governments to create less of these power plants, but shale gas can. It’s a good medium-term solution, a bridge that’ll help green not just America but the world. It gives the planet the time to develop technologies to drive down the price of renewable energy. We’re already seeing the effects, with solar panels costing 60 percent less than they did a mere two years ago, but more needs to be done. In the meantime, society can lean on shale gas as a greener alternative to coal power. Don’t think that shale gas will fade away after renewable energy rises, either. When weather conditions aren’t optimal for renewable energy, it’s important to have a relatively green alternative, like shale gas, as a backup. Rather than being competitors, shale gas and renewable energy are likely to enjoy a symbiotic relationship for years to come. With proper regulations in place, energy makers can harness the sustainable potential of shale gas, which could be a real blessing for the environment.